In this painting (1), I wanted to represent my recently-adopted home city: Manchester. Like all cities Manchester is, at least in part, defined by its textures: its surfaces and colours. 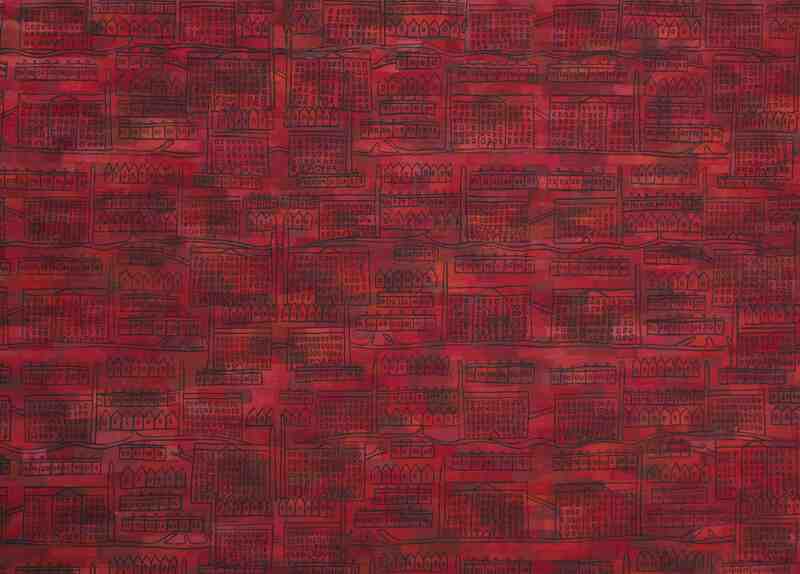 And, for this city, that surface is brick and that colour is red. Yes, brick is used all over the country, being, perhaps, the most common building material, but here in Manchester it is somehow uniquely synonymous with the city as a whole: sodden and almost infernal on the frequent rainy days; warm, rich and earthy when the sun graces the sky. 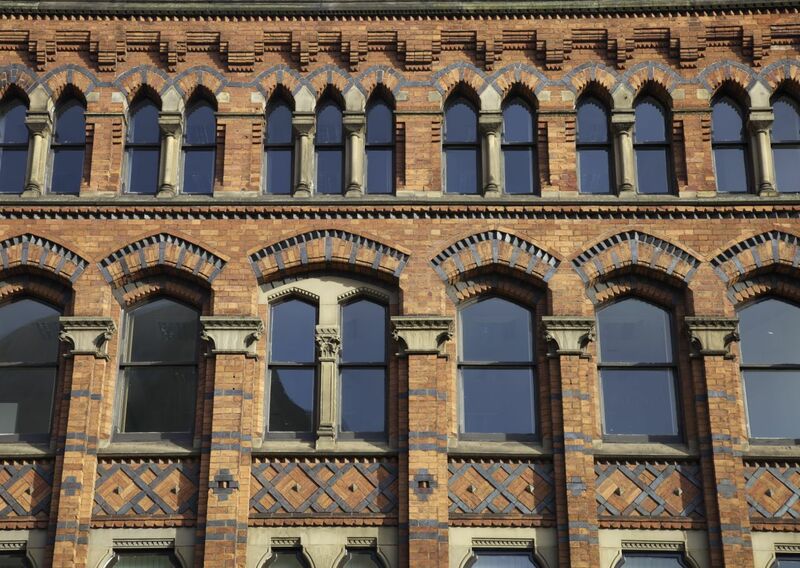 And if you look closely, Manchester’s seemingly monotonous brick is really a rich spectrum of red hues and subtle shapes: from the uneven hand-made bricks of its earliest warehouses (2) to the variegated patterns of its later flamboyant Victorian buildings (3). 3. Warehouse on Princess Street, c.1870s. Fashioned from this omnipresent brick are Manchester’s buildings, particularly its industrial buildings from the days when the city was also known as ‘Cottonopolis’. World-centre of cotton textile production and marketing in the Victorian period, Manchester’s innumerable mills, warehouses and factories were once the defining visual motifs of industrialisation. For early-Victorian visitors to Manchester, like the German architect Karl Frederich Schinkel, the city’s mills that were concentrated in Ancoats presented ‘a dreadful and dismal impression’ of ‘monstrous shapeless buildings’ that Schinkel visualised in a kind of hurried fever in his 1826 sketchbook (4). Schinkel gave us the perennial Manchester motif (passed all the way down to Lowry): the massive utilitarian rhomboid dotted with innumerable but highly regularised windows; and the chimneys of course – a ‘forest’ of impossibly high ‘needles’, according to Schinkel, belching smoke incessantly into the skies over the city. 4. Schinkel’s sketch of mills in Ancoats, 1826. Today, most of these industrial buildings and their chimneys are gone; or, if they remain, the smokestacks no longer smoke and the buildings are either half-ruined, empty or gentrified – ‘post-industrial’ in the literal sense of the word, frozen in an in-between state, no longer industrial but not yet something else. Yet, even this seemingly bygone industry is never ‘post’ – as we all know it’s simply been relocated elsewhere, out of sight, out of mind, halfway across the globe. Once, Manchester’s mills seemed to be literally taking over the world in a vast unregulated conglomeration, a kind of architecture that was dictated entirely by newly-industrialised capitalist production, one that threatened to reproduce itself in unending exact replicas across the face of the earth. 5. Old Mill, Ancoats, 1798-1801. Yet, even in the blankness of Manchester’s surviving mills (5), I find a sense of honesty about industrial production that seems to have been covered over with what’s replaced it (the glass sheen of global finance). 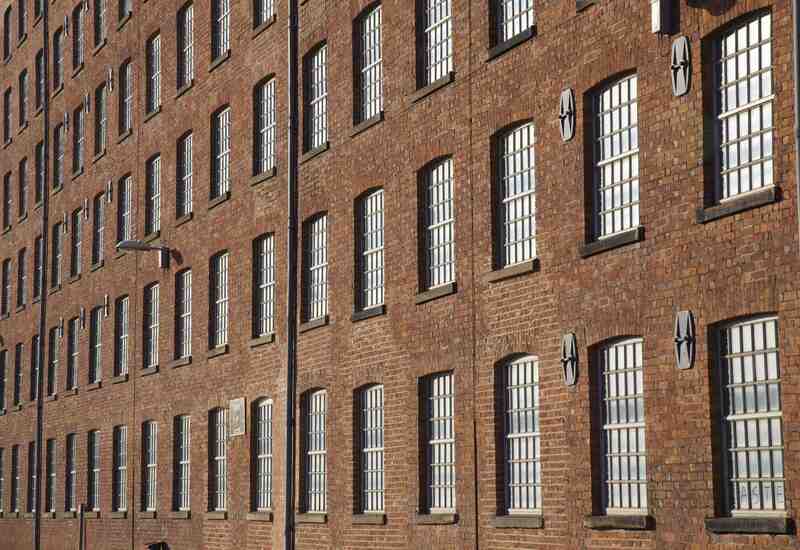 It’s as if the regular, repetitive windows on the surviving mills in Ancoats speak very precisely and transparently about the nature of capitalism itself; each window casts a light on the machine and its workers; each are identical cogs in a wheel; each are bound by the same brutal scientific rationale. 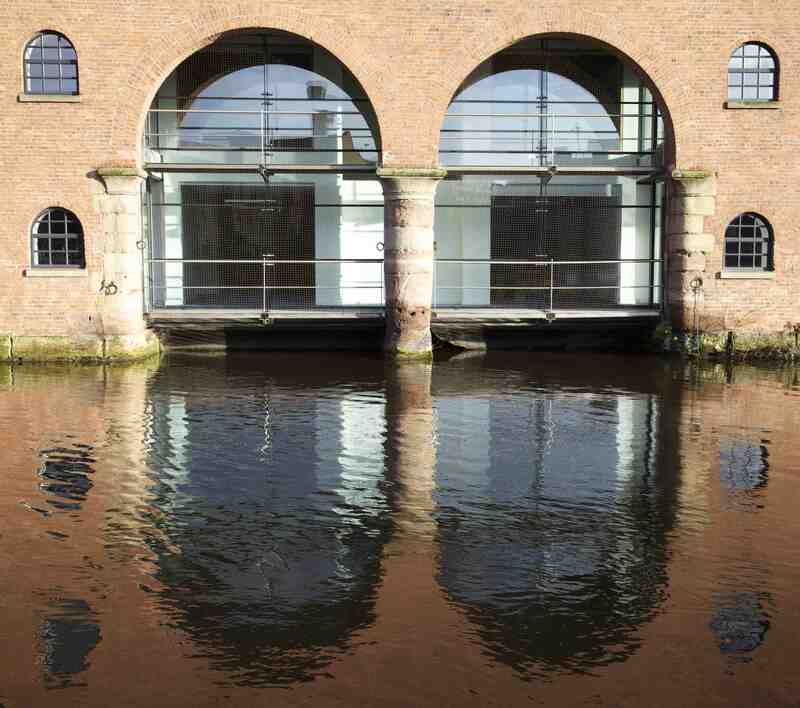 I love the abstract repetition of your painting, echoing the architecture. Interesting to see Schinkel’s drawing too. I would have thought he admired the mills? Thanks Diana. Repetition was a key part of the painting – colouring those bricks nearly drove me insane…Schinkel thought the mills were impressive, in terms of their size, but not architecture, that is, having any aesthetic merit. Powerful painting, especially enlarged where I can see each stroke you made in two different media. So, that’s twice for those bricks! yikes! Thanks! Yes, it was pretty repetitive doing both the bricks and the buildings (especially the windows).